Ok, this may be a bit over the top this time, but we really couldn't help ourselves (read the whole article before you judge - then tell us what you would do...). It's not like we're training aerial combat maneuvers like the Air Force, or mission flight training like NASA, or even product development like our automotive friends. Not even close. More like we're were called to a higher order - fun. FUN, capital F-U-N. And in our book nothing yells fun like a motion simulator. Seriously serious fun. Think about the last family reunion you went to - was it any fun - no. Was there a motion simulator there - no... coincidental? I think not. But seriously, if I may, we were brain storming about the upcoming boat show in town (another staff meeting at the local pub), and I mentioned we needed to step it up another notch. My thoughts turned to family trips to Disney World and Universal Studios - now there's a place that screams fun. I remembered how entertaining the rides were and how the motion simulators made you feel right in the middle of the action... and it hit me... What if we could duplicate the experience of throwing a back roll on a wakeboard or hitting a ski jump at 80mph and flying 240' in the air. Ya, right... No really - a few years back we built a smaller version of this... It was a bit of a stretch to duplicate another one, but not impossible. We surfed the web and found the capsule of our dreams. Built by the same company that builds motion base simulators for the military - I figured these should be good enough for us. Long story short, we took a ride to a local motion base theater that had one on display and made the owner a deal neither of us could pass up... Now all we needed was a film, a controls guy, animator, motion programmer, custom lowboy air ride trailer and a tow vehicle. The easy part was done. I called 3 of the pro riders we sponsor and told them what we were up to and wanted helmet cam video - they were stoked... 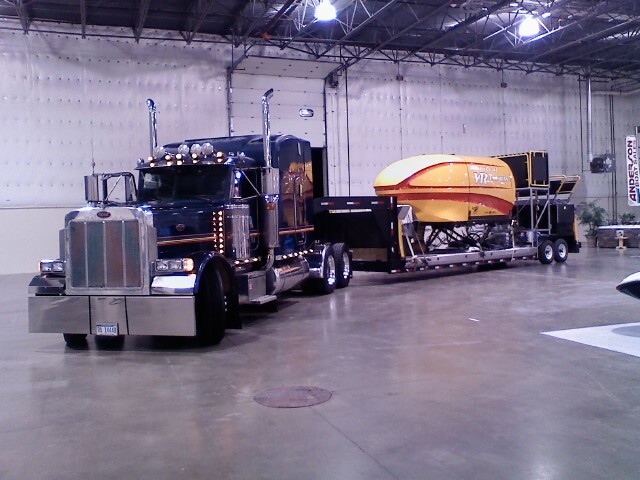 I mentioned to my guys we bought a motion simulator and this winter we're building a dual axle, air ride low boy trailer. Right. Well, as you can see I won the bet and after some shipping repairs, a redesigned control system from a very dear friend out in California, all that was needed now was a video and motion programming. My script focused around launching our viewers from the boat show into outer space, sling shot around the moon and reenter earth's atmosphere, and land in a secret training lake where our pro riders would rip it up for them... Our local college, Ferris State University, provided the talent (see credits) for the animated space shot, and we did the editing in house. We utilized a professional sound studio to make it really rock and we started motion programming. 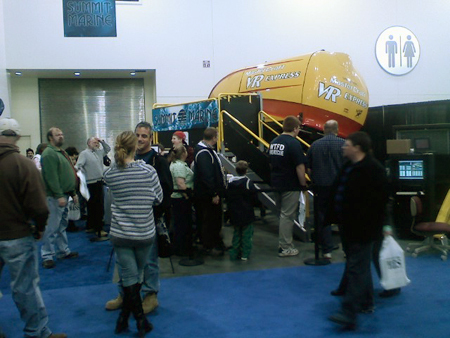 It was a hit - no one had ever combined water sports and a motion simulator ride. Pro riders told us it felt like the real thing - except you don't get wet... Not yet anyway.... So if you have a special event give us a call - maybe it will be available. So now remember the question we started with... "What would you do?" Please view the video and imagine what kind'a fun are those guys at Summit Marine up to next.... Click here to see the video. 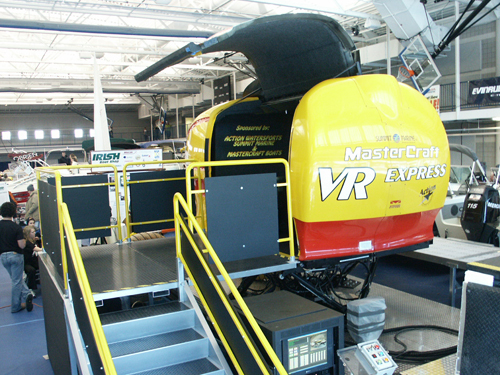 Click the Photo Below to View the Simulator Video. Sit Back and hold on. 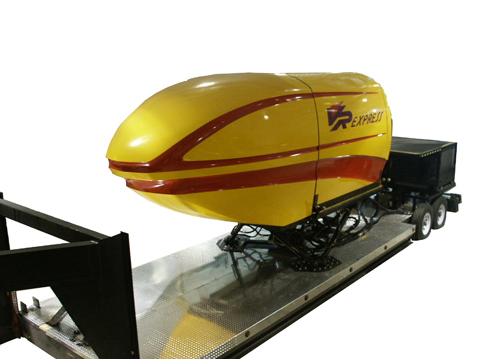 Summit Marine's 12 passenger motion simulator will sling shot you around the moon and reenter earth's atmosphers to land at a secret location in Florida where pro riders Marcus Brown, Andrew Adkison, and Freddy Krueger take you on thrill ride across the water.